On this page you’ll get to know some of the people who make up our school. These administrators and teachers work to offer practical and relevant language courses, to support students in their learning and to maintain a welcoming and professional atmosphere at Oxford House. Neil, originally from Perth in Scotland, has been teaching English as a second or foreign language since 2001, but before that was a university tutor and lecturer in English and Scottish literature for around three years. Bored of being confined to the ‘ivory towers’, he tried his hand at freelance music journalism and even DJing before taking his teaching qualification and settling down to a job he still finds stimulating, challenging and continually surprising. He took his Diploma in 2005, started a teacher-training programme in Guatemala and Honduras in 2008-2009, and moved to Barcelona in October 2010. Teaching students and training teachers at Oxford House have helped him feel at home in Barna, but the city’s atmosphere, lovely weather and impressive array of second-hand record shops have helped him settle too! Kate arrived in Barcelona in 2010 and has been part of the Oxford House team since September 2011. She teaches adults at the school and in the offices where they work. Originally from Lancashire in the UK, she has worked in Honduras, Bolivia, Galicia and the London teaching English and supporting teachers. When she#8217;s not teaching, organising resources at the school or getting involved in Oxford House social events she enjoys hiking in the mountains and exploring beautiful Catalonia. She often mixes up Spanish and Catalan, but speaks Spanglish fluently. Billie did an MA in Communication Research and Phonetics at the University of Bonn and after that studied for a PGCE in primary education at the Manchester Metropolitan University. 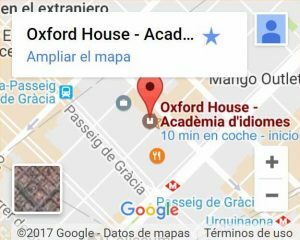 After teaching children for five years, she decided to change her career path slightly and enrolled for a Trinity TESOL certificate at Oxford House Barcelona. After all that studying she is now happily teaching English to adults and teenagers. In August 2013 she completed the Trinity Diploma and decided to leave the UK in order to live and work in the beautiful city of Barcelona. In her free time she loves hiking, reading novels, blogging and spending time with her friends. Since graduating University in 2002 Glyn has worked in advertising and marketing. He has been fortunate enough to live and work in New York, Sydney and London. In early 2012 he came to Barcelona for a two week holiday and he is still here. He is currently teaching Business English and in his spare time he enjoys learning Castellano, playing football and siestas. He is originally from Bristol, England, and he has an interesting and varied trajectory, first in H.M. Forces and then in business, both in sales and management. After 20 years#8217; experience in business, he decided to explore his interest in teacher training and travel working as a teacher. He successfully completed the Trinity College London certificate to teach English with Oxford House in Barcelona. He has been working with us since September 2008. Regina was born in Mexico City and grew up in Monterrey, very close to the U.S. She learnt English when she was very little and perfected it when she lived in California, U.S., for four years. She has worked in different schools, language centers and summer camps. She loves to be a teacher, especially when she works with children; she enjoys the energy and joy they transmit. Regina is also the Administrator and Careers Counselor at Oxford TEFL, our teacher training department. When she isn#8217;t preparing lessons or teaching them, what she enjoys most is traveling, listening to music, dancing, studying reiki, doing yoga and eating sushi. Alexandra was born in Mataró, a coastal town to the north of Barcelona. From an early age she felt the call of Spanish language teaching, so she studied Hispanic Studies at the Autonomous University of Barcelona, where she graduated four years later. Soon after, she decided to specialize in teaching Spanish as a foreign language, so she did an ELE teacher training course. She has been teaching Spanish in Oxford house since 2012 and not only loves teaching languages ​​but she is also passionate about learning other languages ​​and cultures, so she has studied English and French too. Tom is 26 and arrived in Barcelona on the 9th of September this year and is loving his new life. Originally from Sheffield, he spent six years studying and working in Manchester and gained his CELTA qualification during this time. Tom has taught lots of different nationalities since qualifying as a teacher including Saudi Arabian, Japanese, Brazilian, Ukrainian, Turkish and many more. He has a degree in English Literature and Creative Writing and is a self-confessed football nerd who supports Sheffield Wednesday. Duncan Foord is the co-founder of OxfordTEFL and Director of the school in Barcelona. He has more than 20 years#8217; experience teaching English and training teachers, administrative teams and managing teams in matters of methodology, communication and leadership. He has also worked in France, the Czech Republic and Great Britain. He has published two books: #8220;The Language Teacher#8217;s Survival Handbook" (co-written with Lindsay Clandfield) and #8220;The Developing Teacher". His interests include music (he plays the guitar once in a while) and sports (he plays football, but slowly). Nick is the co-founder of OxfordTEFL. He is from London, England, and he started to teach English in Barcelona in 1987. In 1990 he arrived with the idea of staying#8230; for a few months! Since then he has focused on teaching and developing English course programs for companies of all sizes. Nick has the Trinity TESOL Certificate, obtained in 1995. Ivón was born in Cuba and came to Barcelona in 1992, aiming to participate in the Olympic Games as a swimmer. She has been working in Oxford House for six years, in which she has been a receptionist and an accommodation assistant. She is currently the head of Administration. This means managing the paperwork for teachers, students, clients, etc. It sounds boring, but she loves it! Judy is the Director of Studies. Her role at the school is to make sure that things go as well as possible and that the students are happy with their classes and their progress. She is originally from Royal Leamington Spa in England. She moved to Barcelona in 2012 to complete the TEFL training course, and happily she was able to stay and teach at Oxford House. Since then she went on to complete her Trinity DipTESOL and took over as Director of Studies in 2017. She is really excited for the next year of challenges that come with this responsibility and looks forward to see what this opportunity brings. Outside of the classroom she is an avid cook and is often seen researching what new and exciting recipes there are to be created! Irene is the Director of the in-company language department and she teaches English. She was born and grew up in Italy. As an adolescent she discovered her passion for languages and so she studied to be a translator and interpreter. She decided to come to Barcelona on Erasmus 8 years ago to fulfill her dream to live in a big city and she hasn’t looked back. After discovering by accident her passion for teaching English she has worked in a number of language schools in Barcelona. She also managed to get a Masters in the Teaching of the English language at the University of Barcelona. When she’s not teaching English you will find her taking photos or cooking delicious meals for her friends. Brenda is our Marketing and sales coordinator. If you ask Brenda, she will tell you that she loves to work in Oxford House for the variety of people she meets every day and for having such a great team to work with. In a short time she has become essential to the well-functioning of the school. For Sandra, working with the public is an exciting challenge. She enjoys the satisfaction of helping a person find the answer they were looking for. In her personal life she enjoys trying new things. Lately she is learning to sew and to in-line skate, even though they are very different activities! Her real passions, however, are dancing, eating and cooking, especially anything sweet. There#8217;s no better achievement than preparing a meal that everyone enjoys. Laura arrived to Barcelona in 2010 to study journalism and stayed because she fell in love with the city. What she enjoys most about working at Oxford House is getting to know new people and interacting with the students. She has a passion for music so every summer she goes to as many music festivals as possible. She loves visiting new places, getting to know new cultures and she’s also very fond of sushi and Mexican food. Laura is currently studying Business Administration.